What if the world you and I are living in is, in fact, a dystopia? 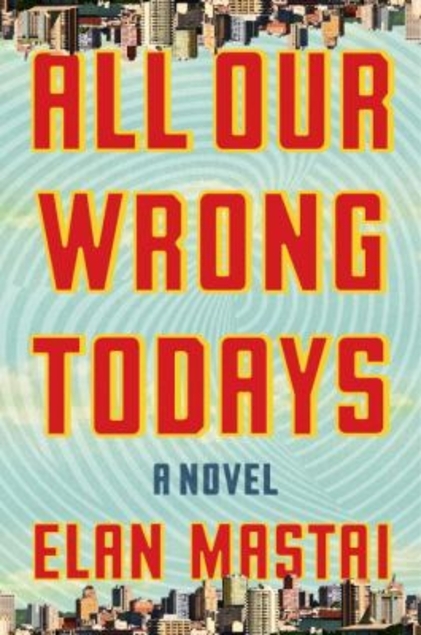 That could (tragically) be the beginning of a review of a nonfiction book, but instead today I’m talking about another parallel universe book: All Our Wrong Todays by Elan Mastai. What if the world we think is real is actually the product of meddling with time travel, and we’re living in the universe gone wrong? Tom Barren lives in a 2016 that looks a lot like the future envisaged in the 1950s. Flying cars, high-tech medicine, an endless supply of free, non-polluting energy, universal peace. It’s all because of a new, energy-generating technology discovered in 1966. When Tom travels back 50 years to the dawn of his age, he inadvertently meddles in that key point in time–and wakes up to find himself in our 2016. But then he has a dilemma–because while the world might be happier in his original universe, his life is significantly better over here. This is one of those books I picked up because it had such an interesting premise–and it largely delivered on the promise, even if it didn’t turn out to be exactly what I expected. I was so fascinated by Tom’s world and the events that led to its creation. There was quite a bit of that, although the world is presented more through contrast with ours then by spending a lot of time in it–which kind of makes sense. For Tom, replicators (or the equivalent) are normal, so they probably aren’t going to come up until he’s trying to make sense of a microwave. We saw the alternate path of history and how a small shift could change it much more clearly, and that was very cool to explore. I liked Tom himself to a surprising degree. He grows a lot over the course of the book–so if you start this and think he’s kind of a pain, give him a chance. He begins as one of those characters who has had everything handed to him by life, but doesn’t have the drive or the insight to know what to do with it. That has been known to bother me (I do mean you, Quentin). As the book develops, though, we find out more about his past that explains some of his aimlessness, and he also matures a lot by the end. This was an unusual writing style, in that it’s very heavily in Tom’s head. Whole sections are largely stream-of-consciousness (albeit about things that are going on, or things in his past) which doesn’t usually work for me but somehow did here. It’s not an entire novel like that–other scenes have setting and dialogue and so on. But we’re very firmly in Tom’s head, sometimes to the exclusion of all else. In a very different direction, I feel like I should give a trigger warning here–most of the book is reasonably tame (adult-appropriate, but still), which maybe is why it seemed particularly shocking when there was a mid-book sequence involving sexual assault. It’s not super graphic, but there are some aspects (which I’m trying not to give away) which make it a particularly disturbing betrayal. Mastai tries to handle it sensitively and I see why it serves a purpose and isn’t gratuitous exactly…but I still probably would have preferred he find a different way to make the point/effect he needed. That section aside (and it really does feel like an odd departure from the rest of the book) this is a cool time-travel, sci fi epic. The question of whether Tom should try to restore his more positive universe, at his own cost, is less a matter of indecision than of pain–he’s not that selfish, but he is very conscious of what he’d be losing. The drive of the book is mostly more about whether he can restore his universe…and that leads to a very exciting climax and a satisfying conclusion. I stayed up later than I meant to reading the last few chapters–and I almost never do that (it’s literally been years). So that’s a pretty good indication!